Hello hello! Merry Christmas dear friends! 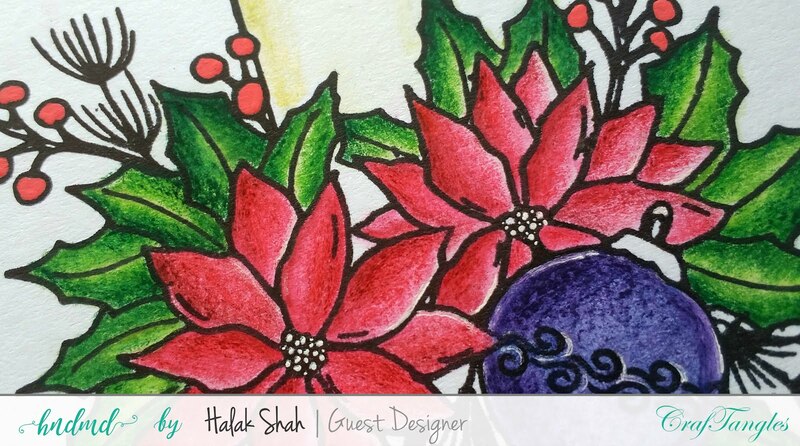 I’m Halak and today I’ll be sharing 4 Christmassy projects with you using the fantastic range of products from hndmd.in. 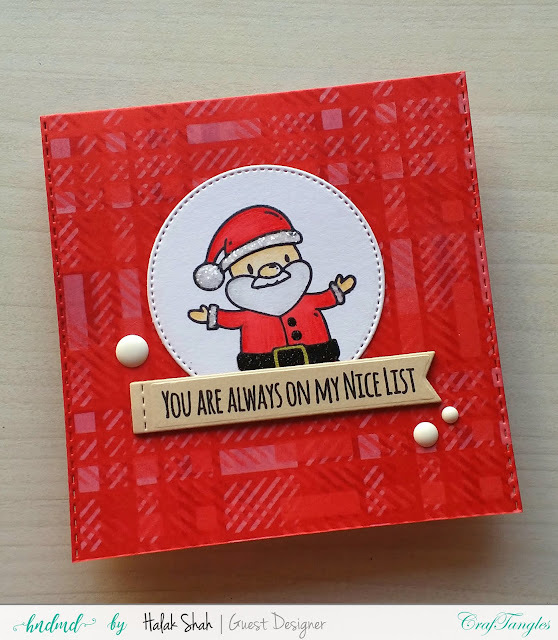 This jolly little Santa is from the CrafTangles – Santa Claus set which has some super cute santa images and a great mix of sentiments! Cut card base using the CrafTangles – Rich Red cardstock and added stiching to the sides using a stitched edge die. 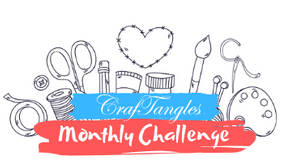 Used the CrafTangles - Plaid stencil with a combo of distress oxide + dye inks. (Offset the stencil 3 times. Ink colors used – Distress Oxide Worn Lipstick, Altenew Ruby Red & Coral Berry). Next, I stamped the santa image using the CraftTangles – Santa Claus stamp set onto white cardstock and sentiment (from the same set) onto CrafTangles – Old Lace cardstock. 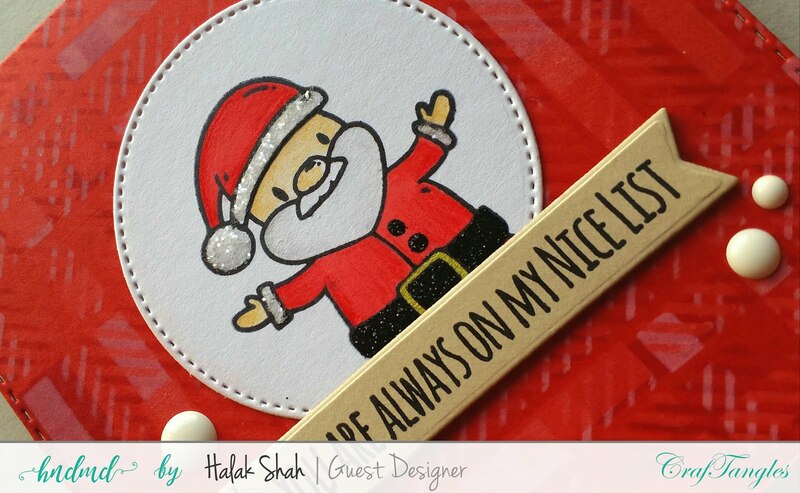 Die-cut santa using a circle die and sentiment using a sentiment strip die. Colored santa, added glitter and matted onto card base with sentiment. Lastly, added some white enamel dots. This stamp from CrafTangles – Holly Jolly Christmas is so very gorgeous, it’s an absolute delight to color! Stamped the images and sentiment (all from CrafTangles – Holly Jolly Christmas stamp set) onto white card base. Added a bit of stenciling to one side using the CrafTangles - Plaid stencil. Colored the images using Staedtler Luna colored pencils. 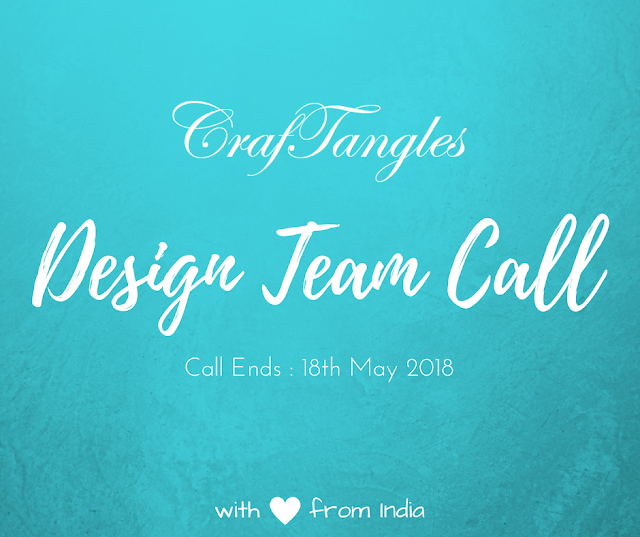 I have used CrafTangles – Christmas Elements stencil. 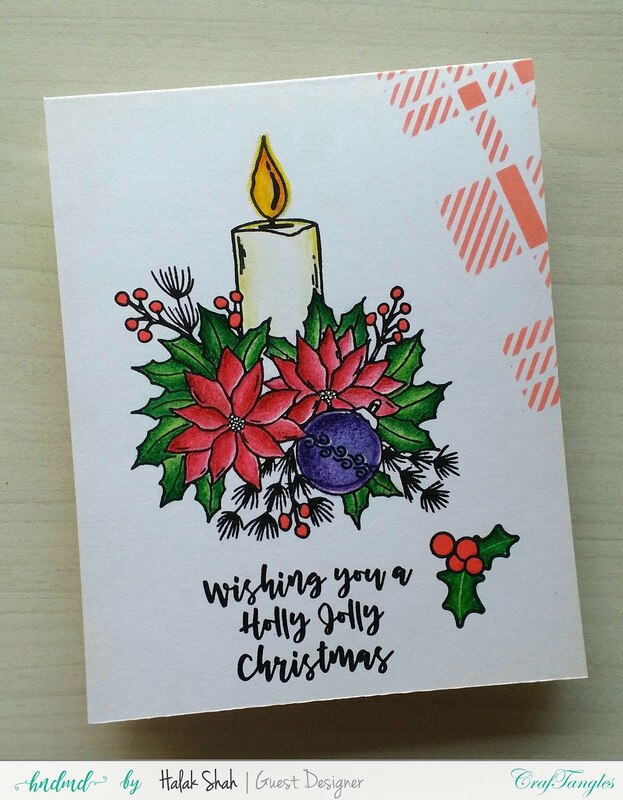 A varied fun mix of Christmassy elements in one single stencil! Cut a piece of patterned paper and stenciled using CrafTangles – Snowflakes stencil with light blue dye ink. 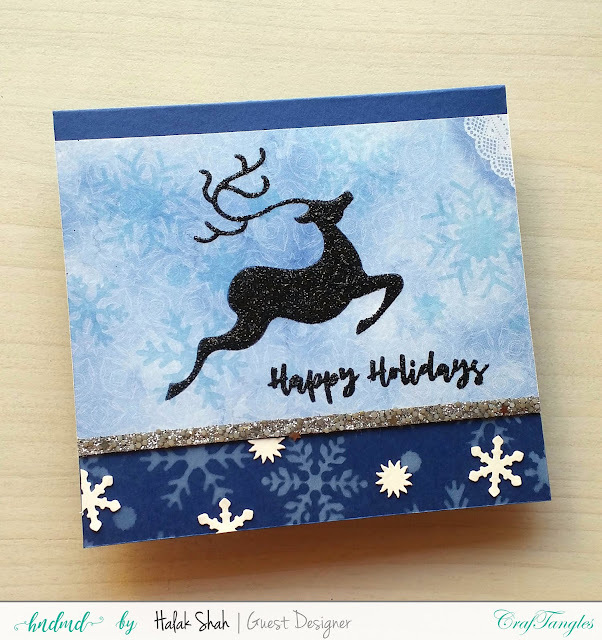 Stenciled reindeer using archival ink and stamped sentiment from CrafTangles – Holly Jolly Christmas stamp set. 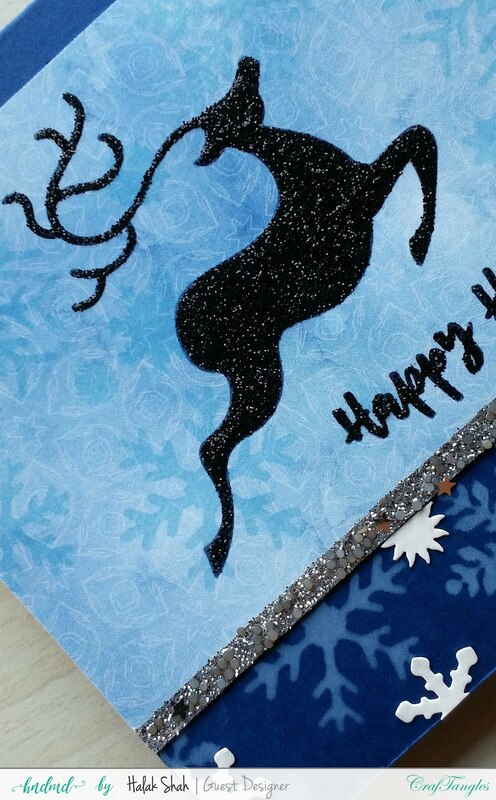 Added glitter to reindeer and sentiment and matted onto CrafTangles – Navy Blue card base. Adhered a thin strip of tacky tape and sprinkled mixed chunky silver glitter on it. Stenciled snowflakes onto navy blue card base using snowflake stencil with white pigment ink. Lastly, added some paper punched snowflake elements to the navy blue base. Took a piece of patterned paper and added Color Burst powders to it (Ultramarinne Blue & Pthalo Green). Once that dried, I took the CrafTangles - Snowflake stencil and stenciled some pretty snowflakes using modeling paste. While the paste was wet, I sprinkled some fine white glitter on it and once it dried, I trimmed and matted it onto white card base. Using CrafTangles – Navy Blue cardstock, I embossed a sentiment from the Holly Jolly Christmas stamp set. Die-cut the sentiment and adhered to the card. Finished it off with a tiny white clay heart next to the sentiment. That brings me to an end of this post. 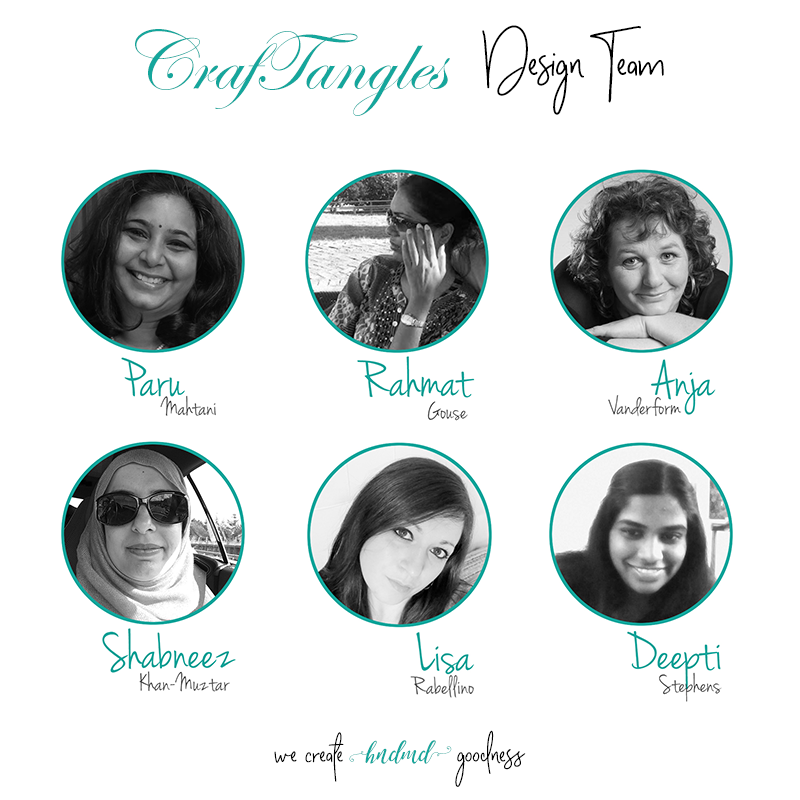 I truly hope you liked my projects and that they inspired you to learn and try something new! The Santa is so cute !